It's not a website. It's not an internet forum. It's not spray, beta, or slander. It's not a text message or a tick mark or a tick list or a film. It's all those things. This year, Red Bull and Chuck Fryberger Films have teamed up to bring you a glimpse inside an elite network of athletes who live their lives to train, compete, explore, and inspire by pushing their limits on the hardest climbing in the world. The best climbers in the world are all connected in a constant cycle of training, preparation, competition, and outdoor challenges. 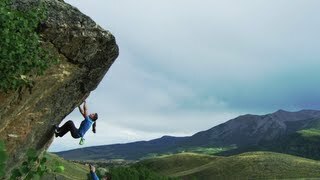 The Network connects both past and present - bouldering, sport, and competition climbing - and this cutting-edge film tangles the viewer inside the spider web of connections that makes up the world of the professional rock climber. Join 6-time world cup champion Killian Fischhuber as he and the best in the game explore areas old and new for adventures, lifestyle, and some of the hardest moves in the world.